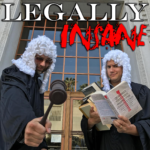 On this week’s episode, Matt and Tony deep dive into some of the craziest and darkest parts of the legal history of the United States. Matt is a recovering Big Law attorney­turned­comedian with a passion for legal history, while Tony has no legal background whatsoever – except for a few minor brushes with the law. Ultimately, it’s Tony’s absurd and funny point of view on laws that will rub Matt the hilarious way. Matt & Tony walk listeners through the divorce law history in the United States as they talks about some bizarre quikie divorces stories from the Reno divorce era and some other famous divorce cases. Also learn why Matt called Tony as the ‘The Ringman’.